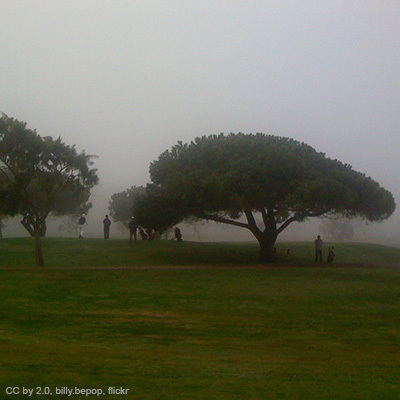 The City of Palo Alto proposes renovating the Palo Alto Municipal Golf Course. The renovation will require the removal of 543 trees; 300 native trees will be planted in the new design, which will also replace approximately 40% of the turf with native grasses and shrubs, incorporate new wetlands, and significantly reduce the amount of land requiring irrigation. This study used the US Forest Service’s i-Tree Streets software tool to determine the annual ecosystem services of the existing tree canopy and compare them with the services estimated to be provided by the new canopy, ten years after planting. Owing to the decrease in the number of trees, the generally smaller mature size of the proposed trees, and the early time point of the comparison, the results show a significant reduction in benefits between the existing forest and the proposed forest, ten years after planting. The existing forest captures approximately 1.1 million gallons of stormwater each year; ten years after planting, the proposed forest will capture 276,000 gallons (a difference valued at $3,300 annually). The existing forest captures 296.1 lbs of air pollutants each year; the proposed forest 52.3 lbs (an $1,800 annual difference). Each year the existing forest sequesters approximately 260,000 lbs of greenhouse gases; the proposed forest, at 10 years after planting, will sequester 17,000 lbs (a $2,400 annual difference). The total amount of greenhouse gases currently stored in the existing forest is estimated at 4.2 million lbs; after 10 years, the proposed forest will be storing a total of 126,000 lbs (a one-time difference of $41,250). On an advantageous note, the proposed forest will have significantly lower emissions of BVOCs, a component of smog: 50 vs 4,710 lbs (an annual improvement estimated at $36,500). Other, less quantifiable benefits will accrue from the proposed design, including greater provision of habitat, improved stormwater management, reduced water use, and heightened sense of place. The report concludes with a discussion of possible strategies for mitigating the lost benefits, while remaining flexible to address the community’s environmental values and objectives. An analysis of one strategy is presented. The complete report can be found at the City of Palo Alto's website.